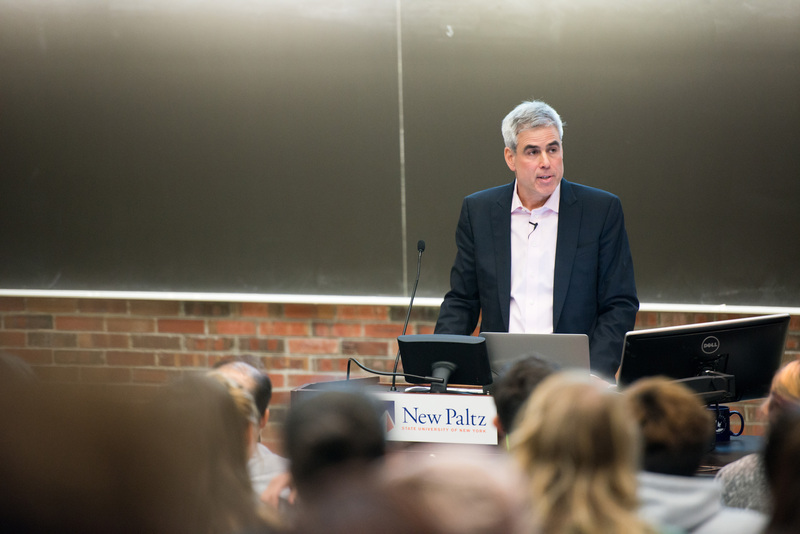 Jonathan Haidt, the Thomas Cooley Professor of Ethical Leadership at New York University’s Stern School of Business and a celebrated scholar of moral psychology, spoke before a standing-room-only crowd of SUNY New Paltz students, faculty and staff on Sept. 29. Haidt’s talk, titled “How two incompatible sacred values are driving conflict and confusion in American universities,” draws from research conducted across the social sciences. In it, Haidt argues that the recent shift in higher education toward policies and practices motivated by social justice advocacy and reform obstructs a more traditional function of colleges and universities: the pursuit of truth. Haidt ultimately contended that the best way to overcome the challenges posed by the shifting priorities in higher education is a “schism” – a clean division between universities that choose to pursue truth above all else, and those that prioritize the advancement of social and political causes. The themes of Haidt’s talk are relevant to ongoing dialogues in higher education at both the national and local levels. Colleges across the nation have endured an array of divisive and well-documented events borne of disagreements about how best to serve their students and their communities. SUNY New Paltz is no exception to this trend. During the spring ’16 semester, a media and politics debate featuring one liberal and one conservative speaker was scheduled and then cancelled by student activities organizers, following a period of impassioned criticism of one of the speakers’ political views by some members of the New Paltz faculty and staff. The cancelled debate has been rescheduled to take place on Oct. 20. In an effort to ensure that the debate serves its originally intended educational purpose, President Donald P. Christian convened a faculty task force on free speech, whose members – Psychology Department Chair Glenn Geher, Philosophy Professor Eugene Heath, Honors Center Director Patricia Sullivan, Associate Professor of Political Science Daniel Lipson, Assistant Professor of Journalism Lisa Phillips, and Emeritus Professor of Political Science Lewis Brownstein – recommended that Jonathan Haidt be invited to provide a broader national context for the free speech dialogue playing out here at New Paltz. “The task force supported our need to provide appropriate framing for the potentially provocative and difficult conversations we may experience, on campus and in the broader exchanges that must occur in a vibrant society,” President Christian said. Further reading about free speech issues at college campuses can be accessed at the website of the Heterodox Academy, a collective of politically diverse scholars, including Jonathan Haidt, who advocate for viewpoint diversity in higher education.